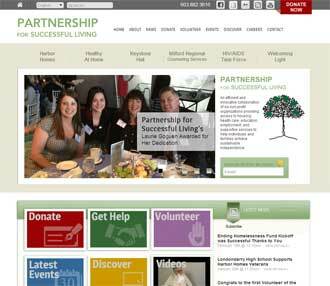 A WordPress multisite (7 websites) for a Nashua, NH non-profit. A non-profit organization needed a group of websites for 7 different missions. The client wanted to re-use the same look and feel, with a different color scheme for each site. Some sites needed to share content using common pages. Working closely with the client, a rich, colorful graphic design was created by Graphic Details of Portsmouth, NH. Photoshop PSDs were provided. A WordPress MultiSite was installed on the non-profit’s Windows Servers. A WordPress Theme with a flexible interface for changing colors was created for the MultiSite. This non-profit and it’s 6 other sites now have a system that can be used by multiple editors, with a consistent look and feel.